I was so surprised I nearly choked on my coffee. Not only had my darling daughter made my recipe, but she’d taken the time to leave a comment. And she’d correctly used a comma! This seemingly small thing meant a lot to me as a mother, a food blogger, and a former English teacher. I’m kidding about the comma (mostly), but if you have kids that live far away, you’ll understand my joy at getting a little message from her in a place I wasn’t expecting it. Since she left to go back to her college town a month ago, I’ve been missing my daily interaction with her. 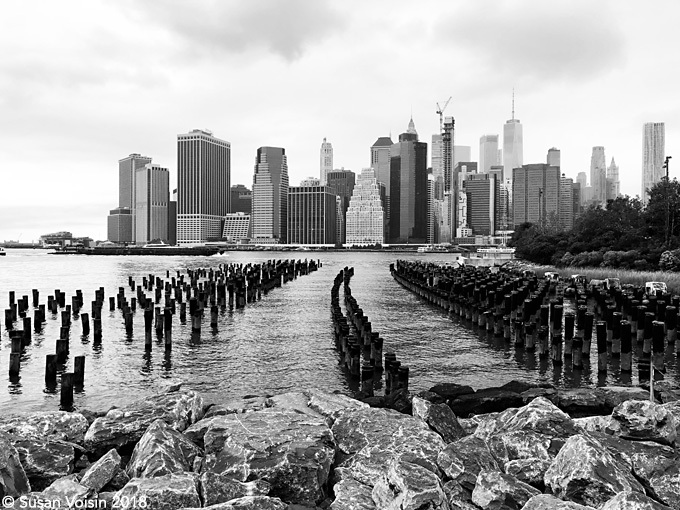 I was hoping my food tour of New York would provide me with some recipe inspiration, but other than a vague desire to create vegan French food, I didn’t come away with any new ideas. But my own daughter’s comment on my Mac and Cheese had me craving it. I just needed to address my one problem with that recipe: It’s supposed to serve 8, but my family of three almost always managed to eat the whole thing in one meal, with maybe a little leftover for E’s lunch the next day. 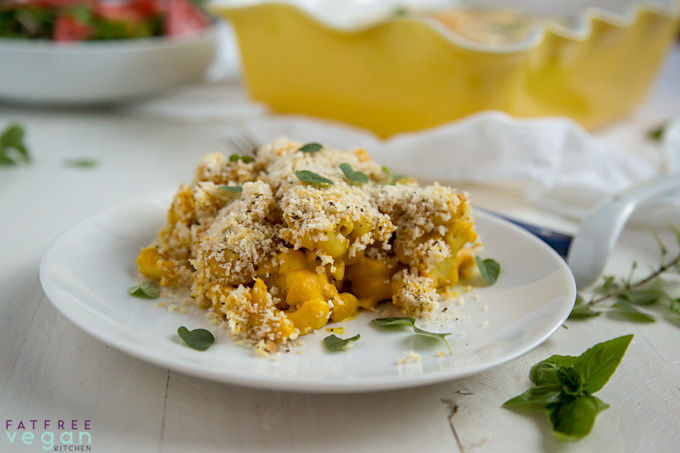 Even vegan macaroni and cheese is pretty calorie-dense without being especially filling. 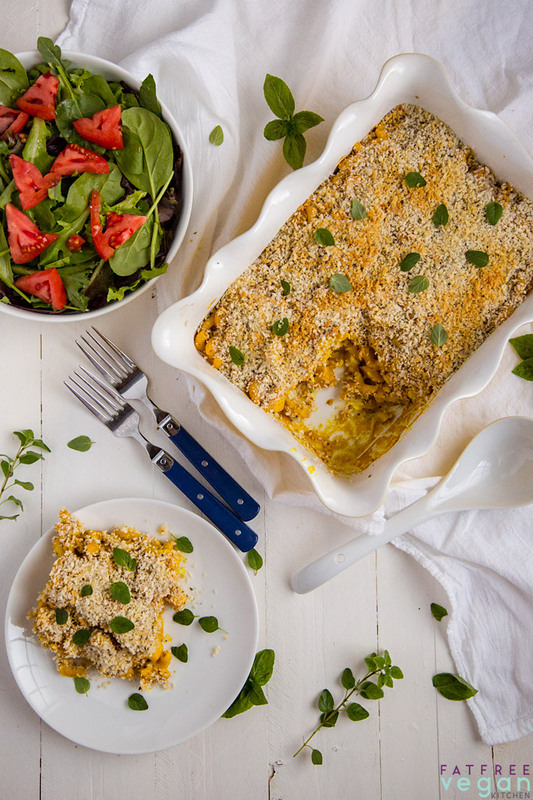 Two ounces (uncooked) of macaroni may be the standard portion, but when it’s combined with just a sauce and no added beans or vegetables, it doesn’t take up a lot of space on the plate or in the stomach. So I got the bright idea to combine macaroni with that great replacer of all things carb and universal stretcher of recipes: Cauliflower. I don’t know where this originated (maybe my daughter), but I disagree. (I also don’t like that comma splice.) I like cauliflower, and the times I’ve used it to replace rice (taco filling, split pea soup) or to add creaminess to sauces (cheesy sauce), I loved it. 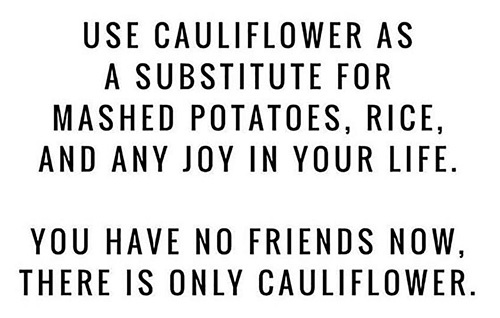 I even have a whole category dedicated to it: Cauliflower Magic Tricks. It’s especially delicious roasted, so I decided to roast it with garlic before combining it with macaroni and cheesy sauce. I used the oven, but if you have an air fryer, you can probably air fry it even faster. I like it super-garlicy, so I used 3 cloves; normal mortals may want to stick to 2. I slightly adapted my nutritional yeast cheese sauce to omit the miso my daughter didn’t have and the tahini, which adds creaminess and calories. I thought it was plenty creamy without tahini, but you can always add a tablespoon or two or a handful of raw cashews to the blender while making the sauce. How filling was it? Well, considering I cut the amount of pasta I normally use in half, one serving with a salad was very filling. I divided the whole pan into 6 servings, not 8, which also helped to make it more hearty. This is one of those recipes that somehow tastes better the next day. Overnight, the garlic flavor becomes more pronounced, so if you plan to make it ahead, consider using the lesser amount of garlic. 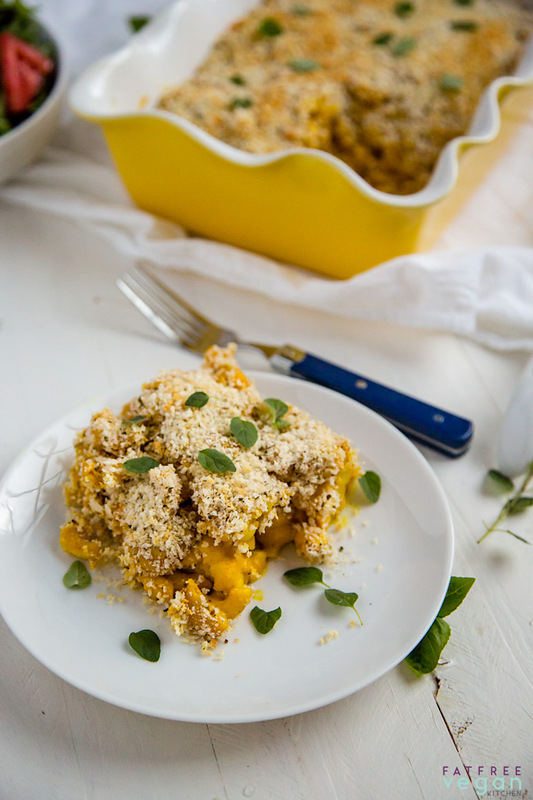 Or just go ahead and enjoy this cauliflower mac and cheese in all its garlicy delight! 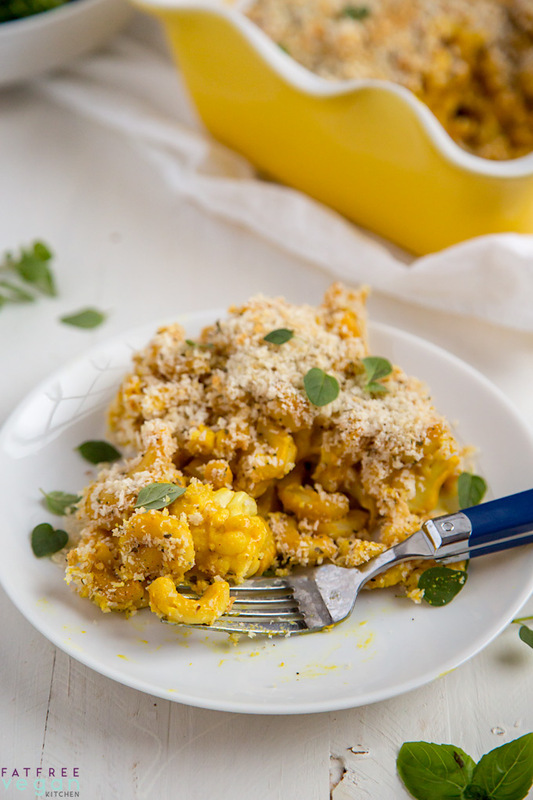 Roasted cauliflower adds flavor and nutrients and makes this main-dish vegan mac and cheese more filling. Preheat oven to 400F. Combine the cauliflower florets in a large bowl with the aquafaba or broth and sprinkle with salt and pepper to taste. Mix well. 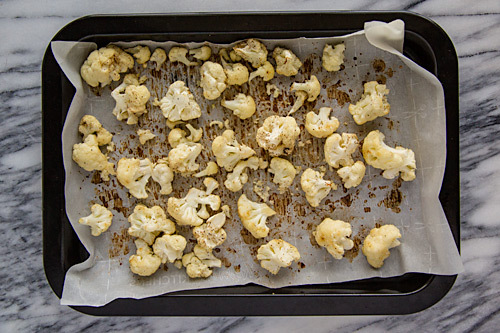 Line a baking sheet with parchment paper and spread the cauliflower on it. Bake for about 15 minutes, until a little tender and beginning to brown on the edges. Stir in the garlic and bake for another minute. Remove from oven and set aside. While the cauliflower is roasting, cook the macaroni in salted water according to package directions. Drain well and return to the pot. Add the cauliflower to the pot once it is done. Place all sauce ingredients in a blender and blend until combined. Pour the sauce over the macaroni and cauliflower. Cook over medium-high heat, stirring often and scraping the bottom, until sauce boils and thickens. Sauce should be very thick. Check the seasoning and add more salt, pepper, or other spices to taste. You may serve the macaroni at this point or add a topping and bake it as a casserole. Preheat oven to 375F. Pour the mac and cheese into a medium-sized casserole dish (the one I used was 6 1/2 x 10 x 2-inches tall.) Combine the topping ingredients and spread it evenly over the top. Bake for about 10 minutes, until top is lightly browned in places. Serve hot, garnished with fresh oregano leaves if you desire. You can make this soy-free by using any unsweetened, plain plant milk instead of soy. Use gluten-free pasta and bread crumbs to make it gluten-free. Check nutritional yeast and other ingredients first to make sure they contain no hidden gluten. Nutrition Facts below use unsweetened plain Silk soy milk and Private Selection Traditional Panko bread crumbs (100 calories per 1/2 cup.) Using other ingredients will change the nutritional breakdown. Omitting the panko topping makes this dish 284 calories, 43g carbohydrates, 448 mg sodium, and 20g protein, and 5 WW Freestyle points. 6 Weight Watchers Freestyle points, including topping. My sister is coming to visit and wants to move closer to a vegan diet, so I will put this on the menu. I will probably use red lentil pasta which should make it more filling. I think all vegan food tastes better the next day, so I cook all Saturday afternoon (soup, pasta dish, rice casserole, full meal muffins, etc.) so I have variety and quality choices throughout the week with a minimum of clean up. I use your cheese sauce all the time on cooked veggies, and it’s always good — with or without pasta. It seems to turn any dinner into a comfort food. I look forward to trying this one. What a great idea. I want to thank you for all your hard work in putting out so many great recipes. Yesterday was our Canadian Thanksgiving, and as I made your Thanksgiving Meatless Loaf recipe (which we all like very much! ), I was giving thanks for you. Your fat-free recipes are wonderful, down-to-earth, and accessible (not many unusual ingredients required!). We had to go vegan and fat-free four years ago for health reasons, and you have contributed greatly to our success (and better health!) in this adventure. Thank you! 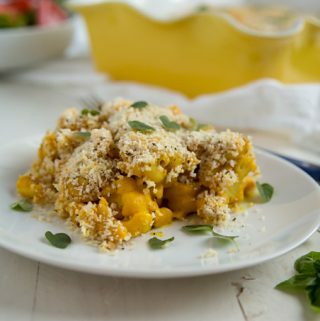 I love using panko on top of mac and cheese! 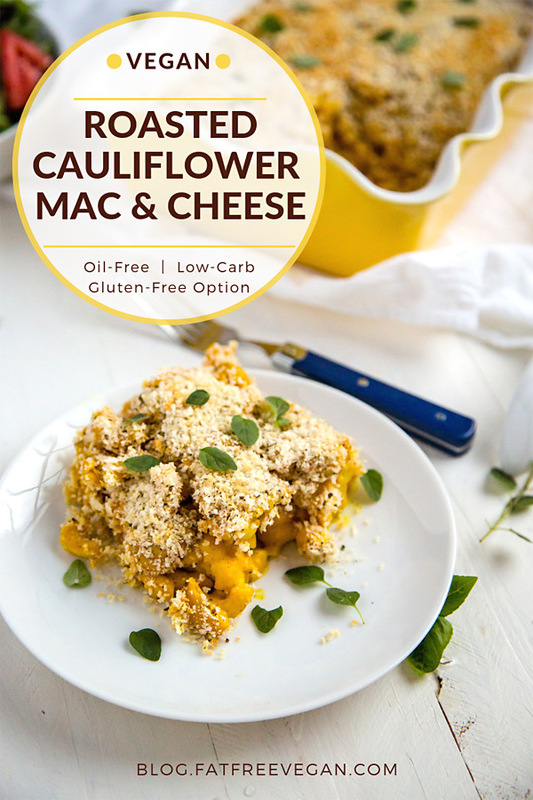 I can’t wait to make this; I’m always looking for new ways to use cauliflower and always end up back at buffalo cauliflower, but I have a feeling this recipe will be a hit with my husband! We’re suckers for mac and cheese, but are easily sucked into using a heavier cashew cream sauce. I know you mentioned in the ingredients that you could use another plant milk than soy, but would almond milk, with its lower calorie/fat content, affect the consistency? We don’t usually keep soy on hand. I doubt you’ll notice a difference between soy and rice milk. I hope you enjoy it! Sounds yummy. How would I modify the recipe to include miso? Just add a teaspoon to the sauce in the blender. If you’re concerned that it might be too salty, you can hold off on the salt until the sauce is cooked and add some at that point. Great recipe! It turned out more like a pasta-cauliflower casserole (I used some pasta from the bulk store, unlabeled, that I found in the pantry – I think it was a gluten-free kind), so there wasn’t much sauce, but it was very tasty nonetheless, and the family voted it a “keeper”. One caution – go easy on the cayenne; very easy to get it hotter than you like. The next time, I think I might add some frozen vegetables as well before baking, so it becomes an “all-in-one” dish, and great leftovers to take to work the next day. This makes a yummy, satisfying casserole. I added a teaspoon of miso per Susan’s suggestion (see comment above), and eliminated the cayenne since I’m a spice wimp. It has a nice mix of soft with crunchy textures and a pleasing savory flavor. Recommended! Hi Susan, just found your recipes and am looking forward to trying some of them. One big question for me : why the smoked paprika? What do you consider as the intrinsic addition that it supplies to your dish? I ask this because I have had to come to the unfortunate conclusion that I really hate it! That is an expensive ‘I hate’ 😜. So, before I start cooking and casting off, could you think of an alternative in your dishes to smoked paprika? I like the hint of smokiness and richness it gives, but I don’t like it in large quantities, so most of my recipes use so little of it that you could just leave it out. Regular paprika would be a good substitute if you don’t have an aversion to it. We made this for supper tonight and it was just as tasty as it looks in your pictures, Susan! We used whole wheat pasta and panko, and did include the tahini and miso because we happened to have them. Delicious! Thanks so much for another wonderful recipe! Was just about to ask about a soy-free mod, but saw your suggestion to use another plant milk. Seems cashew milk might be a good fit for this!